Ah but of course, lately the weather has been a bit cranky. Plus if I’m making cakes or doing some fondant work, I can’t help but have the need to cool down. It’s relatively OKAY cool in where I work fondant but u know, all those kneading and rolling and cutting does make you sweat a bit. So there and then, I decided to make a …. granita!! 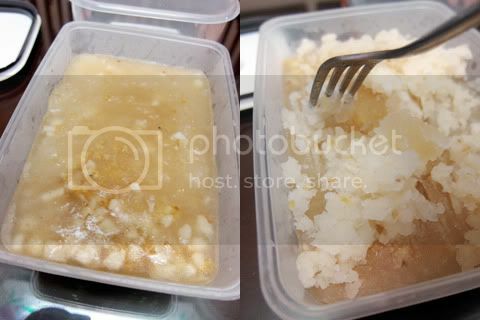 Granita is simply crushed ice (ice kacang!! ), made from a lightly sweetened fruit puree or another liquid. Granita is the simplest to make, requiring no more than a dish, a freezer, and a fork. No ice cream machine required! How well, I shall rest you Mr Ice Cream Maker. I then went too far off, Honey Sea Coconut? Hrmm.. We’ll see. So today’s Ice cream Monday is slightly experimental. It’s the first time I made it and I don’t think I’ve seen anywhere before. I tried searching for a recipe for osmanthus ice cream or something simliar but only a “molecular gastronomy” version came out. Anyways, if you’re interested to try, here it is. 1. 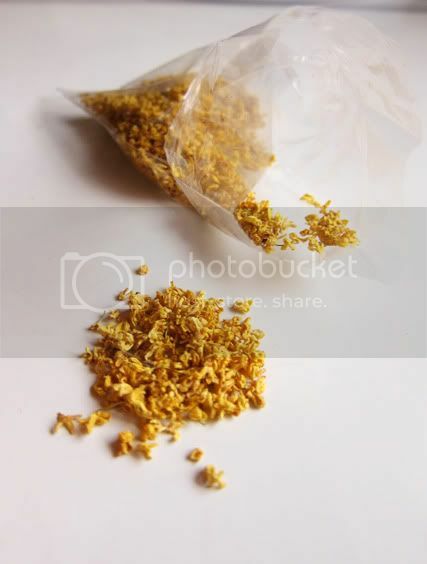 Bring water, syrup, rock sugar and dried osmanthus flower to boil. Then turn off the heat and let it infuse for an hour, till it cools down. 2. 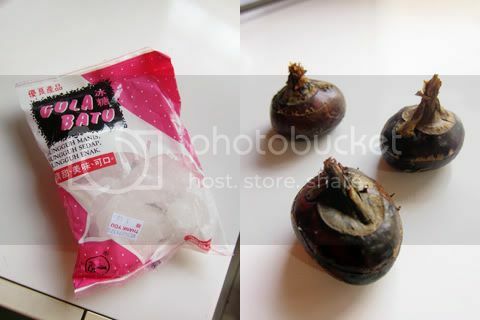 Peel water chestnut and dice them. Add into the liquid and pour in a shallow container. Place in the freezer. 3. Check after about 1 hour. Once it begins to freeze around the edges, take a fork and stir the mixture, breaking up the frozen parts neat the edges into smaller chunks and raking them toward the center. 4. 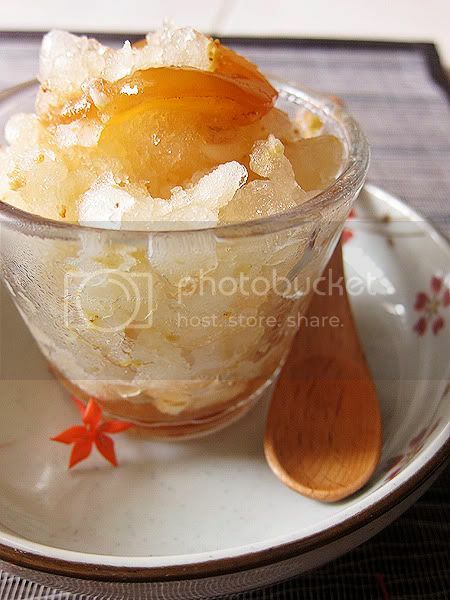 Return the dish to the freezer, then check the mixture every 30 minutes afterward, stirring each time and breaking up any large chunks into small pieces with a fork, until you have beautiful, fine crystals of granita. 5. 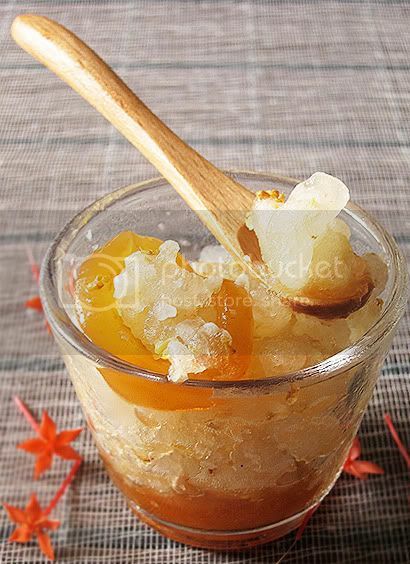 To serve, scoop granita into a cup and add some sea coconut on top, well, totally optional 🙂 Or add some freshly diced water chestnut for some extra crunch! Grate with a fork, how easy is that right!! And it was indeed very refreshing. 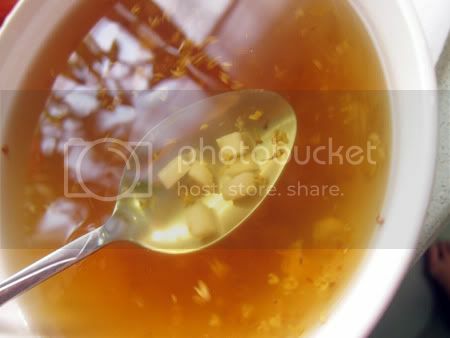 Whenever I feel extremely hot, or I need something to cool down, I’d grab a spoon and dig a HUUUGGEE spoonful and put the whole thing in my mouth. It’s like eating ice as it is, but it melts really quickly in your mouth. I love the fragrance from the Osmanthus and it is very cooling too. It’s like 20% taste of chrysanthemum as well. I may be weird but the feeling’s like it’s sakura season, and the flowers are dropping ever so beautifully. Ok I think I should stop. lol. Absolutely brilliant! The recipe AND the photography. Lovely granita! Looking forward to more ice cream monday posts! Where did my comment go???? I was sure I keyed in the verification code!!!! Oh Shucks!!! Thanks for mentioning me in the post, *Blush*. 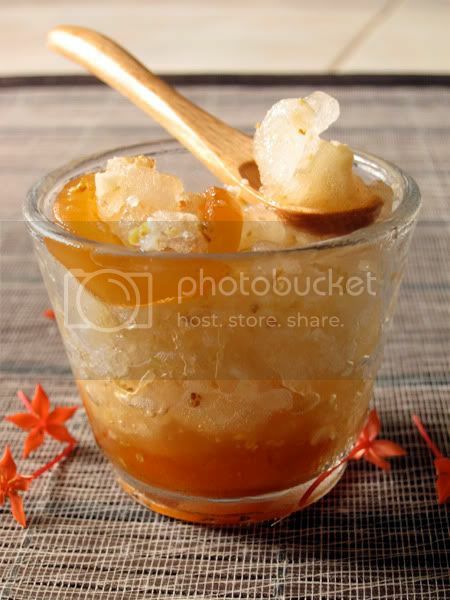 I hope you enjoyed this osmanthus granita. Thanks for the idea, and I'm thinkin of black plums with osmanthus 🙂 Magenta coloured, fragrantly apricotty. Oh yeah, if you want those cheapo ice cream cups and glasses, scout those cheapo RM2 shops. they have loads of stuff that sometimes you'd be surprised with. There's one in USJ court 5 that I frequent and few more in Sri Muda Shah Alam. I'm sure Klang will have some too. 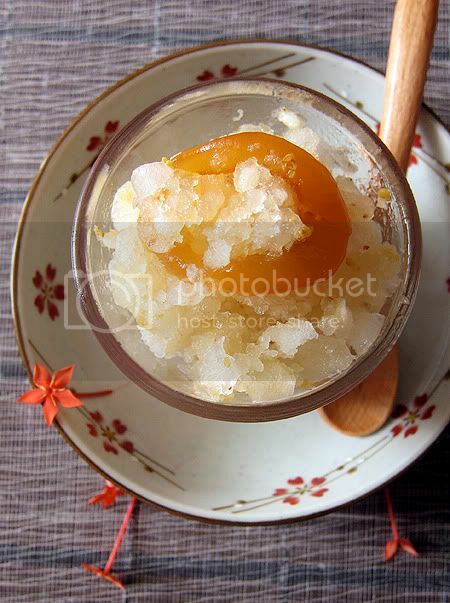 @Rita, thanks, I'm sure there's alot of osmanthus desserts in HK?